Today, Zenmonics, a leading Fintech provider of omnichannel platforms for the global financial markets announced their partnership and formal sponsorship with Queen City Fintech to enhance the ecosystem of technology talent, products and partnerships in the Charlotte area. Queen City Fintech provides fintech startups access to world-class mentors, capital and leading financial services organizations. QC Fintech partners with some of the largest financial institutions and technology providers in the world to provide traction for innovative new startups. Zenmonics, a startup over 10 years ago in Charlotte, has grown to over $20M in annual revenue through software products and services that are dedicated to leading banks and credit unions through their digital transformation. Their platform, channelUNITED®, allows financial institutions to evolve their digital applications across self-service and assisted channels to provide continuous engagement between the financial institution and their customers. “As a Charlotte-based startup that has grown into a thriving Fintech, we are delighted to invest in our tech community and those that cultivate entrepreneurship. The ability to share, mentor and partner in the Charlotte Fintech community is vital to our culture.” says Riaz Syed, CEO and Founder of Zenmonics. 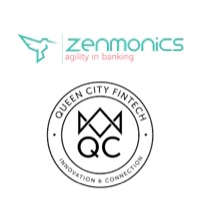 Zenmonics will collaborate with Queen City Fintech, the City of Charlotte, and their additional partners and startups to further enhance the Charlotte Fintech community. "Its so exciting to see a home grown Fintech success story like Zenmonics come on board as a Queen City Fintech sponsor. Companies like Zenmonics and their success are what we are trying to replicate in our program and having them on board as an example of a success story is tremendously important." states Dan Roselli, Queen City Fintech Co-founder. Zenmonics provides licensed software products and supporting services to the global financial services market with their customer experience platform, channelUNITED®.